Priscillas: Happy 4th of July!!! 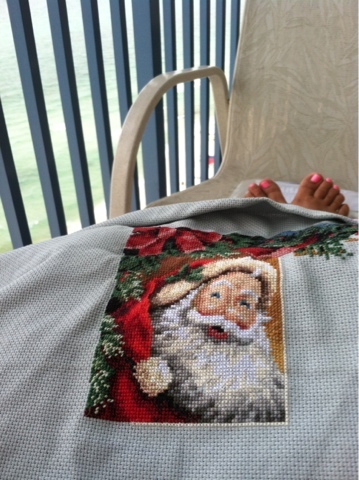 I have made a little progress on Santa ..it's so nice sitting on the balcony in the morning cross stitching ! We are leaving here today (Panama city)and driving to the Clearwater area for a couple days. We enjoyed the beach so much this trip . My boys went jet skiing yesterday ,they had a blast ! Hope you have a safe 4th of July !!! Ooooh, I love your Santa! ♥ Happy 4th! Love your Santa! Do you know we are celebrating Christmas in july over on my Christmas blog??? Santa is gorgeus! I bet your boys had a fabuous good time Jet-Skiing! Home with no Internet !! !